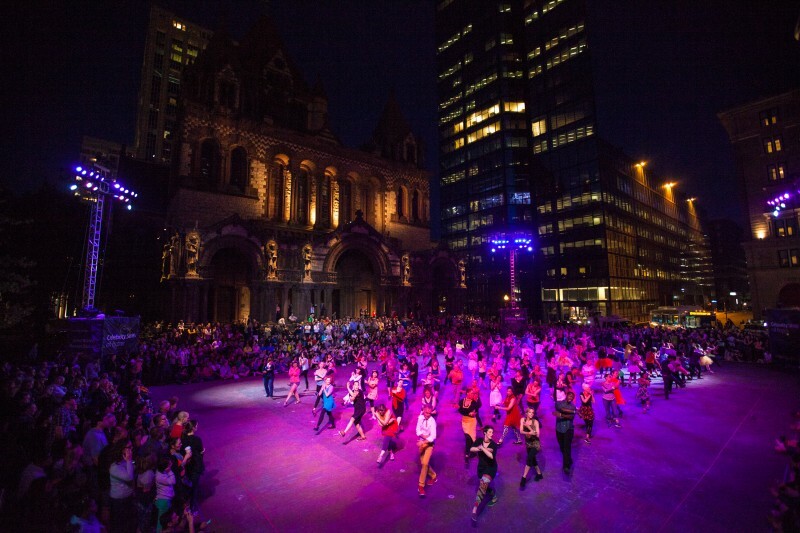 Le Grand Continental® is a free, outdoor public dance event created by the Montreal-based company Sylvain Émard Danse. Celebrity Series presented this special event for three shows during May 16-18, 2014 in Copley Square Park to celebrate the closing weekend of our 75th anniversary season. We kicked off the season in the fall with our first large public project, Street Pianos Boston. These special projects have been our gift to Boston as a thank you for supporting our mission for 75 years. So, thank you! Professions included teachers, an electrical engineer, criminal prosecutor, social worker, university administrator, medical doctor, college students, bartenders, retirees, and a marine! Special thanks to our talented Rehearsal Assistants: Sasha, Ryan, Lindsay, Julia and Rene! Sylvain Émard founded his company Sylvain Émard Danse in 1987. His repertoire of more than 30 original works reveals a creator in full command of his talent, an artist who has won the admiration of audiences at home and abroad. Renowned for his refined style and precise movement, his creation in 2009 of Le Grand Continental® at Montreal’s Festival TransAmériques must have come to some as a surprise. Inspired by line dancing, this unique piece has featured 1000 non-dancers in several performances across Canada, the United States and Mexico, attracting some 70,000 spectators. Recipient of numerous awards, Sylvain Émard’s unique style has led to invitations to work as guest choreographer in theatre, opera and cinema. These collaborations include his joining forces with Robert Lepage in 2005 to work on the opera 1984 by Lorin Maazel, presented in London and Milan. Sylvain Émard Danse receives the support from the Canada Council for the Arts, the Conseil des arts et des lettres du Québec and the Conseil des arts de Montréal. Peter DiMuro is a choreographer, director, teacher, facilitator and arts practitioner/engager. He has toured and taught internationally from Hong Kong to Pigeon Forge, TN, and places beyond and in-between. His Peter DiMuro Performance Associates and his 15-year collaboration with Liz Lerman Dance Exchange laid the foundation for his creative umbrella, PDM: Public Displays of Motion. In May 2013, he was named Executive Director of The Dance Complex, a volunteer-based, artist-run organization located in Cambridge, MA, dedicated to promoting, advancing and sponsoring creative work and education in dance and the movement arts. His many awards include White House Millennial Artist in 2000, and in 2010, he represented the U.S. as emissary for the Department of State in Madrid, Spain. He received an MFA in Dance from Connecticut College, a BFA in Theatre from Drake University, and continued study in New York, Boston and at the American Dance Festival. Mix popular tradition and contemporary art. Combine highly festive line dancing with the fluidity and expressiveness of contemporary dance. When Sylvain Émard accepted the challenge of this unlikely marriage, he had no idea of the enthusiastic audience response he would unleash or of how extremely popular it would become. The marriage of art and the village fête has indeed been consummated. In 2009, Le Grand Continental® featured some sixty dancers at Montreal’s Festival TransAmériques (FTA). The cast doubled in 2010 for Le Très Grand Continental once again at the FTA. It proved as popular as the original, as was El Gran Continental, the version presented at the Festival de México and based on Latin social dancing. In 2011, the concept has led to an entirely new piece. Making its world première at the Festival TransAmériques, Le Continental XL cast of some 200 amateur dancers performing at Place des Festivals. Since then, New York, Philadelphia, Portland (Oregon), and Ottawa were won over by this joyous work. Each of these editions staged 120 to 160 local non-dancers. Now, it's Boston's turn: Le Grand Continental® celebrates the closing weekend of Celebrity Series of Boston's 75th anniversary. The choreography has become richer and the intermingling of genres stronger, but the wild passion of the dance remains as dangerously contagious as ever. And a special thank you to our amazing dancers! Your commitment and passion for live performance is truly inspiring. Le Grand Continental® is a co-production of Sylvain Émard Danse and the Festival TransAmeriques.